/ View from the fort "Batteria di Mezzo"
From any point of Alto Garda you can see the hill of Monte Brione in the centre of the valley. It makes for a lovely walk, but here we tell you how to visit on two wheels! The route develops largely among olive groves, reaching one of the best historical points of interest in Alto Garda: ‘Batteria di Mezzo’, a military battery at the centre of the Austro-Hungarian defensive system of Alto Garda (Festung Abschnitt). In addition to this battery, the defence line included the other nearby forts of San Nicolò, Garda and Sant’Alessandro (near to the summit). The proposed descent to the village of Sant’Alessandro itself, in its first stretch, is rather technical with steps, and some loose, fairly sized rocks. 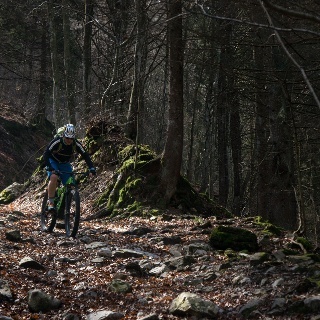 In all - the descent is approximately 300 metres, and we would advise those who aren’t confident with technical descents to ‘walk the bike’ down or simply return via the way of arrival. If you do choose to tackle the descent, remember that this route is also frequented by many hikers, therefore please moderate your speed and give them priority. Monte Brione was considered a strategic point for the control of the Austro-Hungarian border, and climbing up, it is easy to understand the reason. 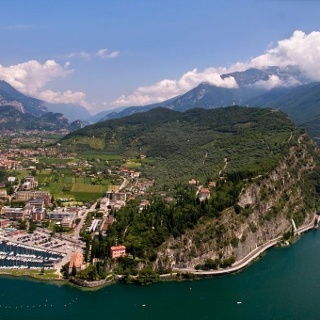 The starting point of the tour is near to Porto San Nicolò, in Riva del Garda. 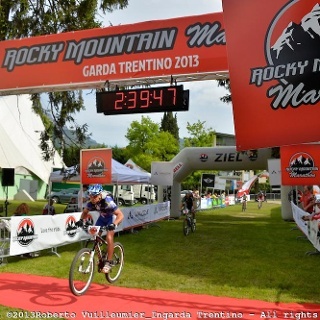 First cross Viale Rovereto onto Via Brione, and after a few dozen metres turn right onto Via Monte Brione. From here you can begin to follow the track, and route signs for 770 that guide you up hill. The constant gradient of almost 10% leads to a quick altitude gain, and the view of Riva del Garda becomes more wonderful with every hairpin. After about 2.5 km, on your right, you’ll reach a dirt road, partially closed by a barrier. Here the route signage directs you to continue straight. However, the track suggests keeping right to join the forest road instead. So, following the track, turn to the right, passing the barrier and continuing onto the dirt road. 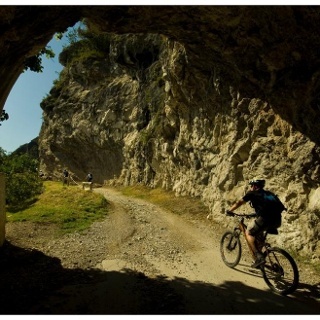 After just over 500m, you will reach the ‘Batteria di Mezzo’. By dismounting your bike and walking around to the front of the fort, you’ll be rewarded with a magnificent panorama of Alto Garda. The forest road continues up another 500m where you’d find yourself within a naturale reserve. The road stops here, so if needs be simply retrace it back to the previous barrier. Anyone wishing to avoid the technical descent can decide to keep left here, and return back to the starting point via the same route of arrival. However, for the technical descent, turn right, and after about 700m - on your left, you’ll see the entrance to the path. 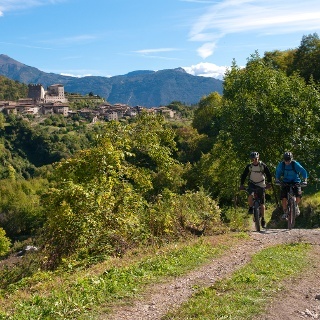 Reaching a cement road - follow it downhill until the village of Sant'Alessandro. Here, go straight to arrive at the stop sign on Via Sant’Alessandro. Cross the road and continue straight onto a gravel road. Continuing in this direction, first on the cycle path, then on a secondary road between the hotels, you’ll once again arrive at Porto San Nicolò, the route starting point. Porto San Nicolò is located on the main road that connects Riva del Garda to Torbole sul Garda and is easily accessed by the cycle path that connects the two centres. Ample paid parking available in Porto San Nicolò. Recht einfacher Uphill für eine lohnenswerte aber kurze Abfahrt. Der Uphill geht eigentlich nur über Asphalt mit einer angenehmen Steigung. Der Trail startet mit einem Seinfeld und wird dann deutlich angehmer aber trotzdem anspruchsvoll. Nichts für Ungeübte oder Neulinge! Unten mündet der Trail dann auf einen Wirtschaftsweg und hat aber immer wieder kleine Abzweige durch den Wald bis man im Wohngebiet ist.